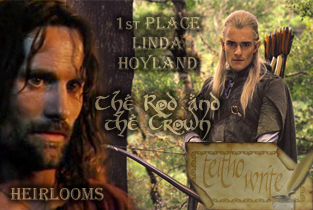 Thorongil beholds some of Gondor’s great heirlooms for the first time. With thanks to Raksha and Deandra. Thorongil’s footsteps echoed loudly as he walked slowly towards the dais in the vast hall. In all his travels, he had never seen the like. The Golden Hall in Edoras seemed small and cosy beside it, as did the Hall of Fire at Rivendell. No hangings or tapestries adorned the walls instead great statues were set between the pillars of carved black marble that supported the roof of this vast place. The statues all wore crowns and with a thrill, Thorongil recognised them as his kinsfolk. He glanced upwards; the vaulted roof was inlaid with gold, and decorated with brightly coloured designs, which were brightly illuminated by the sunlight streaming through great windows. His attention was drawn towards the great throne at the far end of the hall. Many steps led up to the great seat, above which was a canopy in the shape of the winged crown. He recalled seeing pictures of in the library at Rivendell. Behind the throne was a carved image of the blossoming White Tree decorated with jewels. Thorongil’s heartbeat quickened. This was the throne of Anárion, sire of the line of his own foremother Firiel. This was the very throne that he, Aragorn, son of Arathorn, was born to claim. He clutched the letter in his hand more tightly as he approached the old man who sat on a plain black chair on the lowest step, holding a white rod. He halted three paces before the man as he had been instructed. Thorongil tried to quiet his pounding heart. He told himself sternly that there was nothing to fear, but at this moment he would much rather have been fighting a whole army of Orcs! He collected his thoughts, all too well aware that the Steward carried a good measure of the blood of Númenor in his veins and might well possess the power to read the hearts of Men as result. The old man raised the rod and beckoned Thorongil to come closer. Thorongil could see now that it was adorned with a gold knob, and decorated with mithril, crystal, and mother of pearl so that it almost equalled the splendour of the Sceptre of Annúminas. It seemed that the Stewards’ heirlooms now equalled those of the Kings! “So you are Thorongil, the captain that Thengel of Rohan has sent to me?” said the old man. “Gladly, my lord.” Thorongil smiled back. He had expected to dislike the man who ruled in his stead, yet his first impression of Ecthelion was a favourable one. He had been fond of Thengel and hoped he might grow to like Ecthelion too in time. Three days after his arrival in Gondor, Thorongil was summoned to appear before Ecthelion again. This time, though, the Steward was in his private chambers where he offered Thorongil cakes and wine and questioned him closely concerning affairs in Rohan. Thorongil told him of life at King Thengel’s court, of the battles the Rohirrim had fought against Orcs and Dunlendings, of the fine herds of horses that roamed the plains surrounding Edoras and of the great feasts in the Golden Hall. At first, he was wary, fearing that Ecthelion might seek to learn the true identity of his new captain. The Steward did indeed ask if Thorongil had any family, to which he answered truthfully that his father had died in battle when he was a young child and that he had a mother in the northlands. Ecthelion nodded sympathetically and asked no further questions. When the Steward dismissed Thorongil after over an hour of conversation, it was with an invitation to dine the following week. An unlikely friendship soon developed between the Captain and the Steward. Thorongil sensed that Ecthelion had been lonely since his wife died. His position made close friendships with his peers difficult. It was easier for him to seek the company of an outsider under the thinly disguised excuse of discussing military tactics or life at Thengel’s court. Ecthelion and Thengel corresponded regularly and the Steward would tell his captain news of the court he had recently left. Thorongil too, was somewhat isolated. He enjoyed the company of men he had been assigned, but he tried to avoid over much of the society of his fellow officers, lest his guard slip when the wine flowed too freely at the taverns they frequented. He grew to enjoy the Steward’s company. As time passed, Ecthelion would often seek his counsel and sometimes for a few moments, Thorongil felt almost as if he were the King and Ecthelion his Steward. At other times, the old man seemed to him almost like the human father he had never known. As time passed Thorongil had beheld the white rod so often that he felt he could have drawn an accurate picture of it in his sleep! One night he had a dream that the Steward of Gondor knelt before him, offering him the white rod and the rule of Gondor that it symbolised. The Steward was not Ecthelion, though, but a young man that he had never met. At first, Thorongil wondered if this were a vision of Ecthelion’s son and heir, but as soon as he met Denethor he realised that it was not. Denethor took an instant dislike to his father’s new captain. Thorongil was saddened by this, for the blood of Númenor ran true in Ecthelion’s son and he had a more kingly demeanour than even Thengel of Rohan. Denethor was a master of lore and a seasoned warrior with the ability to read the hearts of Men. Thorongil could no more imagine Ecthelion’s disdainful son kneeling before him than the dead White Tree sprouting blossom overnight. He veiled his thoughts in Denethor’s presence and kept his distance. Thorongil’s military duties often called him away from the City. He was successful in battle and won great renown, which raised him even higher in Ecthelion’s favour. Thorongil was always pleased to see the Steward whenever he returned to Minas Tirith, but whenever he was in the City, everywhere he beheld the royal emblems of the Winged Crown and the White Tree, emblems of the crown of Elendil and his heirs, the crown he could not yet claim. Had Ecthelion been a younger man, how different matters might have been. The Steward would have at least given his claim to the throne a fair hearing, but his son was a different matter entirely. If Thorongil pressed his claim, it would lead to kinstrife and most likely bloodshed that could fatally weaken Gondor against her ever more powerful enemies. Thorongil knew he dared not claim the crown, but how he longed to see it and not just a carved representation! He had learned that the winged crown lay in the tomb of King Eärnil in the Silent Street, where his son, the last of the Kings had left it before going off to do battle with the Witch King never to be seen again. He wondered how he might gain admission to the tomb and made discreet enquiries, only to learn that no one was permitted to enter save on the Steward’s authority. To purloin the key to the House of Kings from the porter who guarded it would have been an easy enough matter for him, but he felt loth to do so. He felt he would be betraying Ecthelion’s trust in him. Moreover, Elendil’s heir should not have to sneak into a tomb to look upon his crown like a thief in the night! “Of course, my lord, I would be glad to accompany you.” Thorongil tried to disguise the eagerness he felt. And how did Ecthelion know that he so badly wished to visit the tomb? Had his affection for one he had come to love caused him to drop his guard? He knew all too well that people who were close friends could sometimes know what each other was thinking even if they were not of high Númenorean lineage. Ecthelion’s expression betrayed nothing though, but Thorongil knew and trusted him well enough to know he would not seek to lay traps for him, unlike Denethor. Early the next morning, when very few folk were yet abroad, Thorongil and Ecthelion made their way to the Silent Street. To denote the solemnity of the occasion, the Steward bore the white rod in his hand. The porter greeted them at the doorway and unlocked the door for them, then preceded them within bearing a lighted torch. He placed the torch in a sconce and then withdrew to allow them to pay their respects privately. The dead kings were laid out on tables to resemble beds. They had been so skilfully mummified that many of them looked to be simply sleeping. Thorongil had been in the presence of death many times before, but this felt different. He felt a mixture of reverence and awe, combined with a vague unease that the mortal remains of these distant kin of his still remained long after their spirits had departed beyond the circles of the world. He preferred the custom of the North, where the dead were returned to the earth. A sudden thought struck him; were he ever to be king, this would be his final resting place too. Thorongil nodded, not trusting himself to speak. Ecthelion fumbled at his belt, where he kept many keys and selected one with which he unlocked the casket. He lifted out the crown, which gleamed softly in the torchlight. It was shaped like the helms of the Guards of the Citadel, save that it was loftier, and it was all white, and the wings at either side were wrought of pearl and silver in the likeness of the wings of a sea-bird. Seven gems of adamant were set in the circlet, and upon its summit was set a single jewel the light of which went up like a flame. Thorongil gazed upon it in awe. “It is a fair thing, indeed is it not?” asked Ecthelion. “Most fair.” Thorongil realised he had been holding his breath. Ecthelion looked at him for a long moment then replaced the crown it its casket and locked it again. “And there it must rest unseen until the rightful King should come to claim it,” he said. “When the time is right he will come, if it be the will of the Valar,” said Thorongil. “Was the original rod lost then?” asked Thorongil. “What man knows what the future might bring?” said Thorongil. “I grow weary and this staff weights heavy in my hand,” said Ecthelion. “Carry it for me, Thorongil, back to my chamber.” He held out the white rod to the younger man. Thorongil hesitated for a moment then looked Ecthelion in the eye. Ecthelion might be aged, but he was still vigorous and hardly likely to be wearied by carrying the white rod to the Hallows. The old man looked on him with affection mingled with sorrow. “I will bear it for a little while,” he said. Though neither of them would voice it aloud, he knew what this gesture signified. Sudden foresight came upon him and he beheld another in Ecthelion’s place with the same love shining in his eyes giving a white rod to him. Cheering crowds surrounded them in contrast to the near deserted Court of the Fountain. “The House of Húrin has ruled faithfully and well,” he said as he took the rod from Ecthelion. Side by side, the two men walked away from the withered tree. Summary: As the day for Aragorn’s coronation approaches, Faramir has a problem. The day of the new King’s coronation was fast approaching and Faramir’s brief tenure as ruling Steward was almost ended. He was untroubled by the fact. He had always believed that there could be no greater honour for a Steward than to surrender the White Rod to the rightful King when he returned, the symbol of a trust faithfully kept throughout the long years of waiting. Little had he ever imagined that the honour would fall to him, but now that it had, he was determined that the transfer of power would be swift, willing, and gracious. He did not expect the new King would have much need of a Steward once he was crowned, especially not a son of Denethor, but he would always be Arandur, the King’s loyal servant. He doubted that there would be any place in public life for him, though. The King would appoint advisors of his own choice. Faramir intended to live quietly in Ithilien where he had some ancestral lands. First though, was the coronation of the King. It had been decided that Aragorn Elessar would come with his retinue to a barrier, which had been erected to serve as a temporary gate to the City, where Faramir would greet him and surrender his office to him, which was symbolised by handing him the White Rod. Everything was in readiness. Even at this moment, the people of Minas Tirith were decorating the streets and tending the flowers for the great day. Faramir decided that to prepare for the ceremony, he ought to practise handing over the White Rod. Unaccustomed as he was to bearing it, he did not want to brandish it like some sort of weapon and thereby risk striking the King; neither did he want to hold it as an old man might clutch his cane. His father had always carried it as if it were a part of his very arm! In fact, it had felt so much a part of Denethor that Faramir had not sought to carry it at the meetings he had presided over since his father’s death. Now he came to think of it, he did not even know where it was. He called for a servant and asked them to summon Caranthir, his father’s personal servant, who had aided Denethor in dressing for his official duties. He would surely know where the White Rod was kept. Caranthir was an old man, but since Denethor’s death, he appeared even older than his years. He was now stooped and walked much more slowly than had been his custom as he shuffled into Faramir’s study. “You sent for me, my lord?” he enquired in a thin reedy voice. Faramir noticed that the old man’s eyes were full of sorrow. It seemed that he was one of the few who had truly loved Denethor rather than simply respecting him. Caranthir paled and swayed on his feet. Faramir hastily bade the old man sit down. “Are you unwell?” the Steward enquired. He poured a glass of wine from the carafe upon his table and offered it to Caranthir. “I am well enough, my lord, but did you not know about the fate of the rod? I can hardly bear to speak of it.” His voice shook as he spoke. Caranthir sighed and took a deep breath before he spoke again. “My lord, I was one of those who was commanded to follow Lord Denethor to the Silent Street. I stood by when Mithrandir arrived and ordered you to be taken to the healers. The Grey Wanderer begged Lord Denethor to forgo his deadly purpose, but he would not listen and cast a torch upon the pyre.” Caranthir paused, wiped his brow, and then swallowed hard. “When Lord Denethor…when…when he burned, he…he destroyed it! He said he would never yield to any heir of Isildur’s, then broke the white rod in twain across his knee and cast it in the flames before he-.” The old man broke down, unable to continue. Faramir could not have been more shocked if the old servant had struck him across the face. The White Rod was the symbol of the Steward’s office; an office that had been performed by the House of Húrin for well nigh on a thousand years. And his father had destroyed it together with his own life? The young Steward struggled to keep his composure at these tidings. It was bad enough that Denethor had not sought an honourable death in battle when all had seemed lost, but to desecrate the White Rod thus as well, was a bitter blow indeed. “That will be all, Caranthir, you may go now. One of the guards will help you to your quarters.” Faramir hastily dismissed the old servant, fearful that he would betray his distress in front of him, not to mention his anger. His father’s retainers appeared to have done nothing to try to prevent their master from succumbing to his crazed purpose. He inwardly shook himself, knowing he was being unfair. His father had never been an easy man to cross and in the final week of his life his wrath had been feared by all when his mind began to crumble. Faramir slumped across his desk and buried his head in his hands for a moment. ‘No’, he told himself sternly, this was not the time to weep. The White Rod was no more and tears and lamentations would not bring it back. It was Faramir’s task to find a replacement before the coronation. It seemed a daunting task, though; the White Rod had been a beautiful thing, lovingly crafted from the finest materials and handed down from father to son over the generations. It would be impossible to create another like it at such short notice. The numbers of craftsmen had been sadly depleted during the war and those who survived were scattered far and wide. Materials, too, were in short supply as many of the warehouses had been located in the first level and had burned to the ground during the siege. Faramir thought frantically of what materials might be available to fashion a white rod from in three days. Several múmakil had been slaughtered during the battle of Pelennor Fields and their tusks had been brought to him. Maybe a white rod could be crafted from one of those. He shook his head. The ivory was stained with blood, which was hardly an auspicious start to what he hoped would be an era of peace. But where would he find some white wood? Only the dead White Tree was of sufficient whiteness and it would be sacrilege to hack a branch from it. The King would surely demand his head as well as the Rod should he do so! It seemed all he could do was find a carpenter and see if he could fashion a new one at short notice and paint it white. Faramir sighed. The King had returned after so long only to be greeted with a painted stick! It seemed an affront both to the royal dignity and to the honour of the House of Húrin. Faramir rose from the chair in which he was sitting, rubbing his back as he did so. His father’s chair was the least comfortable piece of furniture he had ever encountered. Even an upturned barrel would have provided more comfort! The Steward started to pace the room restlessly. Then an old memory returned to him of a rainy day during his childhood. His father had just returned from an official function, the White Rod still in his hand and Boromir had admired it. Denethor had smiled indulgently at his eldest and said he was fortunate that one day he would bear such a fine rod as the first Ruling Stewards had carried a much simpler rod, devoid of ornament. Maybe that first White Rod was stowed away somewhere. Gondor was a land steeped in lore and history and did not lightly cast away anything that was part of that history. Faramir hastened to the archives where ancient objects as well as documents were stored. He found the archivist seated at his desk, Master Dior, a man who ever since Faramir had known him, had appeared almost as old as the dusty parchments that surrounded him. Faramir asked him if he knew if the first White Rod still survived. He found he was holding his breath as he waited for the old man’s reply. “Do you know where I might find it?” Faramir asked eagerly. Nothing could have been further from the usual solemn ceremony when an aging steward would hand the White Rod over to his eldest son; nevertheless, powerful emotions seized Faramir as he grasped this tangible symbol of the rule of Gondor. Joy and relief that the White Rod had been found, combined with satisfaction that he could fulfil his duty to his liege lord, the King who had brought him forth from the darkness. Faramir studied the rod carefully as he took it to his apartments to be cleaned. He supposed it had last been used around the time of Belegorn. It was a simple white staff, without adornment. It was beautifully crafted from a type of wood with which he was not familiar, which had not rotted at all over the centuries. It seemed to reflect the humility with which the early Stewards had approached their office, a humility still outwardly observed in the Steward’s humble seat at the foot of the throne, but sadly long since lost once the House of Húrin took on the duties and powers of kings; the virtues of royalty and the failings too, culminating in Denethor’s destructive pride. It was fitting that his office should end in the same spirit in which it had begun. Faramir, heir of the House of Húrin and the last Steward of Gondor, would faithfully discharge his final duty as Arandur. Aragorn had given the White Rod little thought since Gandalf had told him of Denethor’s final moments. He had briefly wondered whatever Ecthelion would have thought of the loss of the precious heirloom. He was certain his old friend would have grieved deeply that his son had fallen to such destruction. He was certain, though, that Faramir would find something suitable for the ceremony as his young Steward seemed both sensible and resourceful. Faramir was a grandson of whom Ecthelion would have been proud. Prince Imrahil had told him that the old man had doted upon the child. Maybe his Númenorean foresight had told him that Denethor’s youngest son would grow to be a man of exceptional quality. Aragorn’s dreams and visions were clear to him now. It must have always been destined for Faramir to be his Steward. His heart full of joy, he approached the barrier, which formed the gate of City he was now to dwell in as King. Faramir approached and humbly knelt before him. “The last Steward of Gondor begs leave to surrender his office,” he said. And he held out a white rod. He smiled at Faramir as he spoke. Together the bearers of the White Rod and the Silver Crown would work to bring peace and prosperity to Gondor. A/n. Some descriptions are taken directly from Tolkien’s “Lord of the Rings.” This was written for the Teitho “Heirlooms” challenge where it was placed first.